In The Culture Code Daniel Coyle explores and answers two primary questions: Where does great culture come from? And how do you build and sustain it in your group or strengthen in a culture that needs fixing? The doing of culture is synthesized in three critical skills. While addressing big ideas, Daniel Coyle personalizes his narrative, describing how restaurateur extraordinaire Danny Meyer, “is relaxed and alert but unhurried. His voice is steady, with a Midwestern earnestness that’s vaguely reminiscent of Jimmy Stewart.” Like the wisdom of characters played by that famed actor, Danny Meyer brings extraordinary insight, prioritization, and systematization to his work. When it comes to systemization, Meyer relentlessly pushes “his leaders to seek opportunities to use and model the key behaviors. He began to treat his role as that of a culture broadcaster.” He explains: “You have priorities, whether you name them or not. If you want to grow, you’d better name them and you’d better name the behaviors that support the priorities.” Priorities in a Danny Meyer restaurant are: one, colleagues; two, guests; three, community; four, suppliers; and five, investors. Informed by place-anchored values, from having grown up in St. Louis, his hiring strategy tilts towards people from the Midwest. While the wait staff might share the orientation of those drawn to New York for the excitement, edgy energy, opportunity, at the core they bring Midwestern goodness to their work, to their purpose of creating great experiences for their guests. Modeling the best nonfiction writing, Coyle sprinkles his pages here and there with side comments that provide another perspective, a contextual reference, a complementary insight that promotes reader engagement, thereby deepening message relevance. For example, Cooper, the Navy SEALS’s “the best in creating great teams,” was attracted to the SEALS by a history teacher telling him, “SEALS are highly intelligent, copious readers.” This seemingly counterintuitive statement deepens readers’ engagement, for most perceive SEALS as uber warriors, excelling at physical confrontation, so the author’s positioning them as cognitively deep is a juxtaposition. But then as you read on, it all makes sense, because SEALS must master much information, which facility is reading enhances. The SEALS’ extraordinary cohesiveness is fundamental to their potent effectiveness, for SEALS epitomize the proposition that the shared experience of physical challenge builds cohesion. Tellingly, central to the SEALS’s effectiveness is a probing After Action Review, a truth-telling session led not by commanders but by enlisted men. “What were our intended results? “What were our actual results? “What would we do the same next time? Daniel Coyle relates the fascinating research story about four person groups tasked to build the tallest possible structure using marshmallows, a yard each of string and transparent tape, and 20 uncooked spaghetti. Surprisingly counterintuitively, kindergarten teams dramatically and consistently outperformed groups of lawyers, CEOs, and business school students. Business students prioritized what “psychologists call ‘status management’ they are figuring out where they fit into the larger picture . . . their interactions appear smooth, but their underlying behaviors are riddled with inefficiency, hesitation and subtle, competition.” All of this distracts from the task at hand. 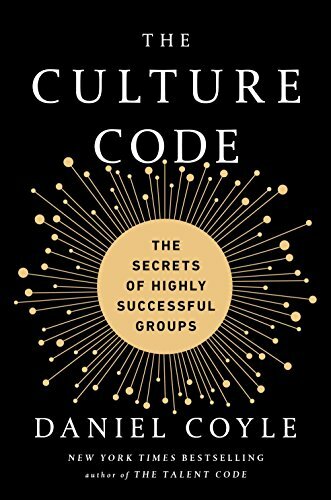 The Culture Code does not disappoint, for Coyle eloquently, evocatively, effectively informs and illuminates the true meaning of “culture as derived from the Latin cultus, which means care.